If you are a manufacturer or private-label reseller of vortex shedding and fluidic flowmeters and you think that they are a commodity product, you may want to think again. Copperhill & Pointer combined the expertise of David W. Spitzer, author, editor, and respected instructor of flow seminars, and Walt Boyes, marketing professional, and industry analyst, to offer a new and unique set of reports to the industry. This series has already set a new standard for useable information and technical completeness, while providing significant new data and conclusions on one of the “workhorses” of flow measurement. 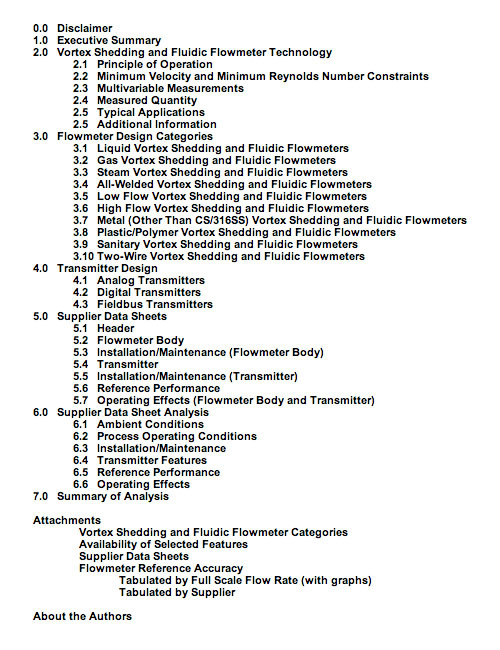 If you manufacture, sell, specify, or use vortex shedding and fluidic flowmeters, this study is a “must have” for you. This report shows that conventional wisdom isn’t always true. All vortex shedding and fluidic flowmeters aren’t created equal. The differences between the manufacturers and models surveyed show that you can differentiate between flowmeters on the basis of performance and features, not just price. 53 companies sell vortex shedding and fluidic. 40 companies manufacture them. Are some vortex shedding and fluidic flowmeters really better than others?